Cryptocurrency buying and selling made easy. 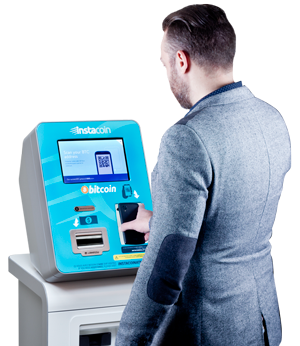 Instacoin Bitcoin ATMs are an alternative to virtual Bitcoin exchange services and meeting with local traders, that allow you to buy and sell Bitcoin and Altcoins with Canadian dollars. Although the Bitcoin industry has adopted the term ATM, an Instacoin ATM (also called BTM or Bitcoin Teller Machine) differs from the traditional automated teller machine you'd associate with banks. Instacoin does not offer any money service or financial product or service. A bank ATM is associated to your bank account and lets you withdraw your money whereas a Bitcoin ATM lets you buy Bitcoin and Altcoins with your money or sell them to get cash ($CND). Why use our Bitcoin ATMs to Buy Bitcoin? With our Bitcoin ATMs, you don't have to fill out a lengthy sign-up form. In contrast, to start depositing and withdrawing at a cryptocurrency exchange, you are required to go through a very lengthy sign-up and identification process that often involves several delays submitting documents, mailing cards and getting approvals. It can take weeks before you're ready to buy your first Satoshi (i.e. the smallest fraction of a Bitcoin that can currently be sent). At an Instacoin ATM, there is no wait. Simply insert bills and buy Bitcoin (or the cryptocurrency of your choice). At an exchange, their processing wait times and the processing and cutoff times for your bank can all amount to several business days. No need to provide banking information at a Bitcoin ATM—we take cash. In contrast, there is an arduous process involved in setting up your bank account to start trading at a virtual exchange. Alternative options, like meeting up with a local bitcoiner, can be a real pain to setup (not to mention risky), but, finding a Bitcoin ATM is easy and hassle-free. Instacoin offers Bitcoin and Altcoins at market rate with a competitive percentage-based fee. Our Bitcoin and Altcoin prices are some of the more competitive one's on the market. They are based on the market rate in addition to a percentage-based fee. Many Bitcoin ATM locations across Quebec, Ontario & the Maritimes. We have 98 Bitcoin ATMs in cities including Montreal, Toronto, Ottawa-Gatineau, Niagara Falls, Quebec, Halifax, Moncton, Charlottetown and St. John's. We are getting ready to deploy several new locations in cities across Canada. We want to you to be able to access Bitcoin and Altcoins close to the home or from wherever you are. Find a location now. Ready to buy Bitcoin or have some to sell?